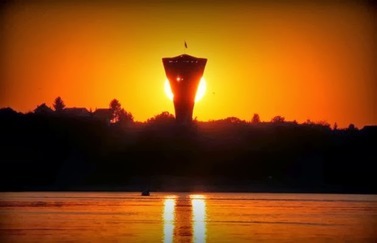 The position of Vukovar and the surrounding areas is at the intersection of important transportation routes, connecting Central Europe with the Balkans, as the Danube region with Dinaric and Mediterranean area of Europe, and thus has combined diverse social and civilization influences. From the Western and Eastern civilization, to Catholicism, Orthodoxy and Islam, this all resulted in a dynamic social development. Due to its many natural advantages (fertile land, forests, rivers) and despite turbulent and far-reaching historical events, this area always had been attractive for settlement. In fact, the area has been settled for 8000 years. The right bank of Danube River was settled by members of the Vucedol Culture at the beginning of the third millennium BC. The needs for cooper resulted in the expansion of the Vucedol Culture into the broader region of Central and South East Europe. This predominant cultural phenomenon had a great influence on other contemporary cultures and it is also left traces in the European heritage. (see the picture: Orion the first Indo European calendar). These favorable natural conditions for life attracted not only those who wanted to establish their homes but also those who want to rule the area. Therefore, various armies passed through area, robbing its natural and economic heritage, and forcing its people into exile. There are numerous archaeological sites in the Vukovar area, many of which tell us about the lives of Illyrians and Celts. The Romans reached the Danube in their conquests during the final decades B.C. and brought the first vineyards. After the fall of the Roman Empire, the Migration Period and the Avar and Slavic expansion from the sixth century onward brought about significant changes. After the Ottoman dominion (16th and 17th century), the German counts of Eltz had a significant influence on the economic and cultural life of Vukovar in the following two centuries. At that time immigrants of German, Hungarian, Jewish, Russian, Slovak, and Ukrainian descent begin to arrive. After World War II Vukovar become a powerful center of textile and agricultural industry in the former country, Yugoslavia. ​Unfortunately, the witnesses to the past or recent Vukovar has not spared the region new destruction. The city was destroyed in 1991. As the conflicts which begin out of the fall of Communism, the war in Yugoslavia served as important theoretical grounds for discussion over the nature of ‘ethnic’ or ‘ethno-national’ conflict. Nationalism and trauma transmission from WWII were artificially revitalized by demagogues, as Bogdan Denitch wrote, “Yugoslavia had been arguably the most successful experiment in building a multinational federation in Europe since the Second World War ” [B. Denitch, Ethnic Nationalism: the Tragic Death of Yugoslavia (University of Minnesota Press, 1994), p. 1]. Frank Wright, political scientist, noted that, since 1945, the Serbs, Croats, and Muslims seem to have lived in something like harmony. The ethos of the common curriculum in schools was provided by the Communists’ unifying myth, which – unlike those in other parts of Eastern Europe – had a very large core of truth. It told how all the nations of Yugoslavia had taken part in the liberation together. The story of the Partisans was like an umbrella, or transcendence, over all the Yugoslav nations. In 1988 I heard this story told often and with conviction, but it was combined with slightly over-anxious denials that the differences between Serbo-Croat nations mattered anymore [F. Wright, Integrated Education and New Beginnings in Northern Ireland, Corrymeela Press, 1991, p. 15]. „The Bosnian Serbs, Croats, and Moslems have been adorned with many different cultural uniforms over the centuries by which they identify one another as the enemy when conflict breaks out. Despite this, underneath the dress they can see themselves reflected – it is the awful recognition that these primitive beasts on the other side of the barricade are their brothers which has led to the violence assuming such ghastly proportions in Bosnia. The only way that fighters can deal with this realization is to exterminate the opposite community. How else does one explain the tradition of facial mutilation in this region? ” [M. Glenny, The Fall of Yugoslavia (Penguin, 1992, 1996) p. 172]. Something similar is applicable in Croatia. During the last few years there has been considerable reconstruction in Vukovar, which was almost totally destroyed during the recent War. Although efforts have been made to repair the physical damage to property and infrastructure, the impact of the war continues to impinge on all aspects of the Vukovar-Sirmium County's social and economic life. Eastern Slavonia, as a war-affected area, is depopulated, economically underdeveloped, lacking in or suffering from destroyed infrastructure, has lands not cleared of mines, etc. Moreover, the return of internally displaced persons (IDPs) and refugees has not yet been completed. Significant resources are required for this purpose, especially in terms of housing, communal infrastructure, and (re)construction, and political will. 51 703 people from Vukovar Sirmium County were displaced. This was 71.2 percent of the population. 36813 people have returned, according to available data from Vukovar Regional Office. Demographic trends have been among the main issues featuring high on the public agenda since Croatia declared its independence in 1990. Public discussions have mainly had nationalist inspiration (referring to the ‘strength of the Croatian nation’). Population projections do not offer any optimistic expectations. There are a few different population projections for Croatia, including the UN’s World Population Prospects (http://esa.un.org/unpp). Croatia does not have a legacy of judicial independence. Reform has been part of the government agenda, particularly since 2000, but political influence, as well as capacity issues, are often cited as a concern in external assessments of the reform process. There was a marked increase in government efforts to investigate corruption allegations, but the complex cases pose a challenge to a judicial system that is still developing. Civil society organizations have become stronger. In the past, the public was often unwilling to support civil society initiatives, a tendency usually attributed to Croatia’s experience with socialism, as well as a decade of the Tudjman government, which treated independent civil society with unfriendliness. Though there has been very slight improvement, there has not been sufficient progress in the position of grassroots organizations. Through EU accession, Croatia has the opportunity to overcome some of the characteristics of war-torn areas, such as social exclusion and economic deprivation. However, this is possible only if the mechanisms and funds available were to be complemented by an integrated approach to reconciliation and recovery that includes work on psychological trauma and social inclusion. In addition, while this region is progressing towards EU membership, while there is at least some understanding at national level, the border management approach at the regional level remains fragmented and non-cooperative. Displacement due to conflict and war and, more generally, life in a post-conflict situation generally requires major adaptations, as people need to redefine personal, interpersonal, socioeconomic, cultural, and geographic boundaries. This implies a redefinition of individual, familiar, group, and collective identities, roles and value systems, and may represent an upheaval and a source of stress for the individual, the family, and the communities involved. Conflict and war create specific psychosocial vulnerabilities that, when combined with other risk factors, including pre-existing conditions and social and security predicaments of the present, can affect the mental health of the individuals involved.